Somehow, someway, Kingdom Hearts III managed to (for better or worse) tie up—most of—its numerous loose ends. While I was ultimately satisfied with Kingdom Hearts III, there has been one thought that kept nagging at me. One character, in particular, has been such an afterthought, it makes you wonder why they continue to be a presence in the series. I’m talking, if you couldn’t tell by the picture, about Maleficent. She is the evil fairy who first appeared in Sleeping Beauty. Despite (supposedly) being one of the series’ chief antagonists, her role in the overall lore has been increasingly diminished with each installment, to the point where she is barely a factor in Kingdom Hearts III. 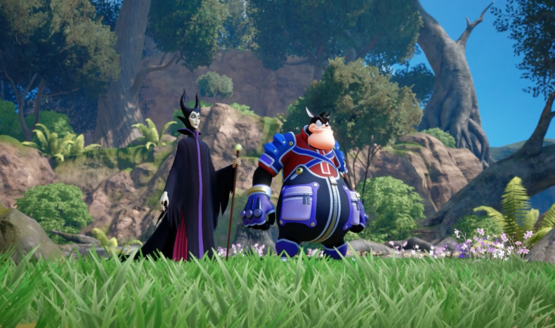 We’ll get into that game in a bit, but the Maleficent of Kingdom Hearts III is a far cry from the Maleficent of Kingdom Hearts. While the stage is set for her to have a bigger role in the series moving forward, the question remains why she was resurrected in Kingdom Hearts II in the first place. It’s a shame to see Maleficent, at once regarded the most fearsome face in the Kingdom Hearts universe, fall so far from grace. 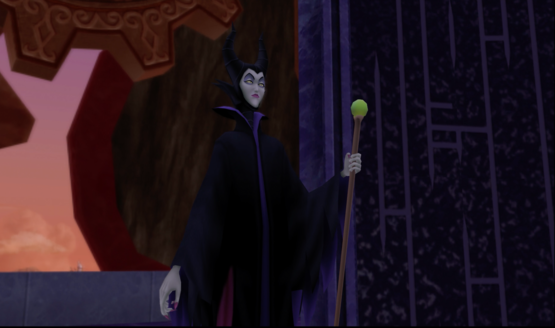 Right up until a late-game twist, Maleficent was the main antagonist of Kingdom Hearts. Leading a cabal of Disney villains, Maleficent and her underlings controlled the Heartless, destroying countless worlds (including her own) in the process. 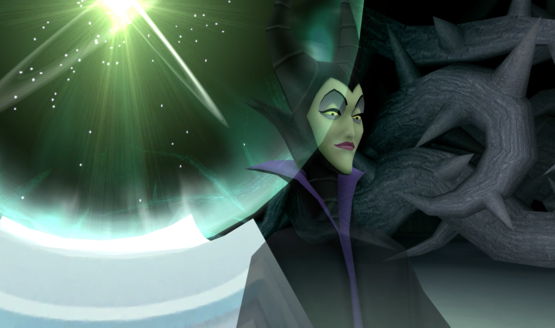 Maleficent and her search for the Princesses of Heart is the driving force of Kingdom Hearts. Sora doesn’t quite know it at first, but his search for Kairi is directly tied to Maleficent’s attempts to control the Kingdom Hearts universe. Yes, it’s true, the darkness does eventually get the best of her. It’s a classic example of hubris, as her overconfidence in using the darkness leading to her demise. But she managed to fall when she was at her highest. All the Princesses were in one place and, though Kairi didn’t have her heart, it was right within her grasp. If she hadn’t overestimated her power, she very well may have succeeded. But of course, this is Disney we’re talking about, and the evil must fall. Though she did fall, Maleficent’s actions sent a ripple throughout the entire Kingdom Hearts universe. It was her manipulations that led to Riku surrendering himself to the darkness, opening up an opportunity to be possessed by Ansem. Her destruction of the worlds is what led Sora on his journey in the first place. She’s indirectly responsible for the creation of Roxas and Naminé. Though Maleficent was no more, her impact remained. This being Kingdom Hearts, no one is ever really gone. Right on cue, she was brought back in Kingdom Hearts II. Seemingly revived by the memories of Flora, Fauna, and Merryweather, it is later implied she came back due to some time-travel shenanigans seen in Kingdom Hearts χ. All that really matters is that Maleficent is still alive and kicking. Which should be great, as she is easily the most powerful adversary Sora has faced, save for Xehanort. The problem is that she’s been little more than a superfluous addition since. Truly, in a game with as many moving parts as Kingdom Hearts II, one has to wonder what the purpose of bringing Maleficent back was. Sure, she has some moments of redemption later on, but her most notable development is her (failed) attempt to take over Disney Castle. She later decides to ruin Christmas, I guess? Maybe (and it’s a big maybe) she presumed that controlling Santa would allow her to control the worlds? Her role is even worse in most of the subsequent Kingdom Hearts games. She attempts to take over the Datascape in Coded and fails. She later makes a underwhelming return in Kingdom Hearts 3D: Dream Drop Distance. There, she kidnaps Minnie, again intent on gaining access to the data of the worlds. That fails, and Maleficent disappears for the rest of the game. The one bright spot in the post-Kingdom Hearts II slump is Birth by Sleep, which, due to the nature of it being a prequel, still features Maleficent in her prime. As a prequel, she is only featured in her homeworld, but it does set up some important beats. Events from and before these moments set her on the path we see her on in Kingdom Hearts. You could lay a lot of the blame on Maleficent’s diminished stature on the people she chooses to surround herself with, namely one in particular. True, Pete was the one who gathered the villainous assembly in Kingdom Hearts and he can take some credit for Maleficent’s success. But geez, he really drags her down when they’re together. Doesn’t he? It’s almost like Pete’s very presence makes her decidedly less threatening, and therefore interesting. In almost every scene they share together, Maleficent calls Pete either “fool,” “idiot,” or something related to that. It makes you wonder why she puts up with him, what with his countless missteps. Pete doesn’t even have a major redeeming moment in the series to his name. Maleficent must be an extremely loyal boss, huh? There is something to be said about Pete’s loyalty, though. While Maleficent’s former allies have all but abandoned her, Pete has always been by her side. Brownie points will seemingly get you a long way, even if you actively drag down your superior. You see, Maleficent’s whole drive in Kingdom Hearts III is to find the fabled “Book of Prophecies,” which is a big deal in Kingdom Hearts χ. Eventually, it does pop up in the epilogue, right next to Luxu/Xigbar. You can briefly see Maleficent and Pete watching Luxu and the Foretellers from above, before they retreat. This sets up some exciting possibilities for Maleficent. Since we know she was actively after the book, there’s the potential for her to be an integral part in the series moving forward. If she really wants the Book of Prophecies (and it sure looks like she does), Maleficent will likely do everything she can to get her hands on it. Her role in the series may have had diminishing returns thus far, but she is poised to make a huge comeback. Or, the scene could have been Maleficent and Pete conceding and giving up their search. Knowing Kingdom Hearts, that’s entirely possible. But let’s hope Kingdom Hearts IV (or whatever the series ends up doing next) does right by Maleficent. The Mistress of All Evil deserves better.